Now open! Recreation Center at Hilltop Campus (7720 W. 143rd Street) in partnership with the Blue Valley School District. 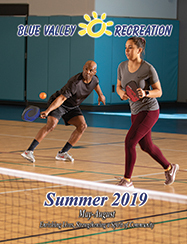 Fitness classes, basketball and volleyball leagues, practices and open court, dance classes, special populations activities, enrichment programs, pickleball, and 55 GO (ages 55 and up) programs offered along with drop-in facility usage. Click here for current membership prices. Please note, there is a $10 change fee to add/delete family members and/or to change your membership type. For additional information, please email Jason Goin.